Lotus is one of those companies that, in addition to making world class sports cars, also spends a significant amount of time in developing technological solutions for other manufacturers. In this case, Lotus Engineering has taken on the task of designing an environmentally friendly vehicle that can run on three different fuels (gas, bioethanol and methanol). 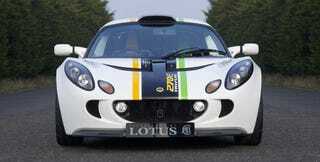 And because they're Lotus, said car isn't a boring sedan but rather the wicked Lotus Exige. While the gas and bioethanol Exige aren't news, this methanol thing is interesting. The fuel purports to take the CO2 out of the atmosphere and combine it with hydrogen to create a carbon-neutral fuel, in theory. The concept application sports a 270 horsepower 1.8-Liter engine good for a 0-62 mph run in just 3.88 seconds. If methanol performance cars are the future, just consider us meth addicts. Press release and more pics below. Lotus Exige 270E TriFuel Lotus Engineering, the world renowned automotive consultancy division of Lotus, unveils its latest development towards carbon neutral road transport at the 78th Geneva International Motor Show. The Lotus Exige 270E Tri-fuel is the most powerful road version yet of the Exige (0-60 mph / 96 kph in 3.88 seconds, a top speed of 158 mph (255 km/h), 270 hp (201 kW / 273 PS at 8000 rpm) and it runs on any mixture of gasoline, bioethanol and methanol. Emerging technologies will allow alcohol fuels such as methanol, already a proven internal combustion fuel, to be made synthetically from CO2 extracted from the atmosphere. An alcohol-based fuel derived renewably from atmospheric CO2 would allow society to transfer relatively easily to sustainable, carbon-neutral internal combustion. Lotus Engineering is researching the use of sustainable synthetic alcohols as potential future fuels, with technology available from Lotus for introduction in four to five years. However, the supply infrastructure investment from governments and fuel companies could take 15 to 20 years. The Exige 270E Tri-fuel is part of Lotus' research to understand the complex combustion process involved in running on mixtures of alcohol fuels and gasoline, which will be important for a successful transition from today's fuels to the sustainable, synthetic fuels of the future. This research is just one aspect of Lotus Engineering's ground-breaking work on environmentally-friendly vehicles. It is involved with a number of electric vehicle projects, has successfully integrated hybrid technologies into vehicles such as its EVE demonstrator, and recently announced results on a collaboration with Continental Division Powertrain on the Low CO2 downsized three-cylinder engine. The research into sustainable alcohols is progressing at Lotus' Hethel headquarters in Norfolk, UK and involves input from the Royal Society of Chemistry's Alternative Fuel Symposium Series, the Low Carbon Vehicles Innovation Platform, developed by the Technology Strategy Board and direct discussions with the University of Sheffield. Methanol (CH3OH) can be produced synthetically from CO2 and hydrogen. Ultimately, emerging processes to recover atmospheric CO2 will provide the required carbon that can entirely balance the CO2 emissions at the tailpipe that result from the internal combustion of synthetic methanol. The result is that a car running on synthetic methanol, such as the Exige 270E Tri-fuel would be environmentally neutral. As well as being green, the great benefit of synthetic methanol is that it would use similar engines and fuel systems to those in current cars; and synthetic methanol can be stored, transported and retailed in much the same way as today's liquid fuels such as gasoline and diesel. Synthetic methanol also possesses properties better suited to internal combustion than today's liquid fuels, giving improved performance and thermal efficiencies. And it is ideal for pressure-charging (turbocharging and supercharging) already being introduced by manufacturers to downsize engines in a bid to improve fuel consumption. Lotus Engineering's Lotus Exige 270E Tri-fuel technology demonstrator illustrates how easy it is for synthetic methanol to be embraced over time as a future fuel for road transport. The Exige 270E Tri-fuel, with its supercharged 2ZZ-GE VVTL-i engine, could be the forefather of a new generation of conventionally driven cars that have the potential to be environmentally-neutral. Mike Kimberley, Chief Executive Officer of Group Lotus plc, explains: "Lotus is a world-class leader in research into a variety of alternative fuels; each has its merits and challenges and some options could be more easily implemented than others. But while motorists want to be green, we do not want to change the culture of total freedom for the owners, who will have an extreme reluctance to spend more at the pump, or to sacrifice the performance of their cars. Mike Kimberley continues, "At present, the motor industry is seeking a route to reduce CO2 emissions just at the tailpipe; this focus is far too narrow. A sustainable alcohol such as synthetic methanol has the potential to reduce the overall CO2 footprint of internal combustion vehicles towards zero. Produced through CO2 recovered from the atmosphere and given a tax incentive, it immediately becomes a green, cheap and more desirable fuel. For those compelling reasons motorists, legislators and car manufacturers must switch to a sustainable alcohol like synthetic methanol." Geraint Castleton-White, Head of Powertrain at Lotus Engineering explains: "For car companies and the motorist, the use of sustainable alcohols like synthetic methanol requires relatively few changes to the vehicle. It can also use the current fuel distribution infrastructure, which is a huge advantage for suppliers. Geraint Castleton-White continues, "We believe that, technically, there are a small number of significant but by no means insurmountable hurdles to the adoption of synthetic methanol as the staple future fuel for internal combustion. We are some way into a number of extensive research projects but of course, we understand that further research needs to be undertaken to fully overcome potential challenges that may arise." David Bott, Director of Innovation Platforms within the Technology Strategy Board in the UK says: "The approach taken by Lotus Engineering is a good balance between the desire for the lowest carbon emissions and the practicality of car evolution. The drive for low carbon transport is a real imperative and its progress will require short, medium and long term solutions." Tony Ryan, ICI Professor of Physical Chemistry at the Department of Chemistry at The University of Sheffield says: "There is a great opportunity to develop methanol as a transport fuel in a mixed energy economy that embraces a wide range of primary energy sources, including nuclear, solar, and other renewable power sources. Combining atmospheric CO2 with hydrogen to form methanol provides a pathway to personal transport with low carbon emissions that uses the existing liquid-fuel infrastructure and Lotus Engineering offers world leadership in the development of engines to use these fuels of the future." The Lotus philosophy is all about performance through light weight. The Exige 270E Tri-fuel is built to the lightest specification possible without resorting to expensive and rare materials. The performance improvements of using synthetic alcohol have been made through increasing the power of the engine without increasing its weight and therefore the overall weight of the car. The heart of the Exige 270E Tri-fuel is a Roots-type supercharger (with a sealed-for-life internal mechanism meaning that it does not require the use of the engine's oil) and air to air intercooler attached to the tried and tested 4-cylinder, 1.8 litre 2ZZ-GE VVTL-i engine. Using a development of the supercharger and intercooler package from the Exige S, the Exige 270E Tri-fuel has peak power of 270 hp (201 kW / 273 PS) at 8000 rpm, 184 lbft (260 Nm) of torque at 5500 rpm, up by 51 hp (38 kW, 52 PS) or 19% and 25 lbft 45 Nm or 14% over the standard gasoline Exige S. Maximum engine speed is 8000 rpm (8500 rpm transient for up to 2 seconds). The low carbon number alcohol fuels methanol and ethanol give more power when burned in the engine than conventional gasoline (petrol) fuel. The performance benefits come largely from the high heats of vaporization of methanol and ethanol, which give strong charge-cooling effects, and the increased octane ratings. There are other secondary thermodynamic effects. Methanol's higher heat of vaporization leads to a slightly higher performance relative to ethanol. All charge air ducting has been kept as short as possible with large diameter pipes making sure that the bends in these ducts are not too tight, to the benefit of throttle response and efficiency. The Roots-type Eaton M62 supercharger is turned by the crankshaft, and has an integral bypass valve for part load operation. The 2ZZ VVTL-i engine has two cam profiles - a high speed cam and a low speed cam. The seamless switch point between these two cams is completely variable depending upon driving conditions and engine load. This gives the Lotus Exige 270E Tri-fuel a smooth and linear surge of power from idle speeds all the way to the maximum 8500rpm. An electronic drive-by-wire throttle ensures the quickest engine response possible whilst keeping the emissions as clean and as low as possible, to meet relevant legislative demands. Six fuel injectors have been fitted to increase fuel flow to the engine at normal and higher engine speeds and loads.